Abraham-Joseph, now 26, told ABC's "Good Morning America" he had no idea what a visa was when his mother brought him to the U.S. at 7 years old. His visa expired in 2006. 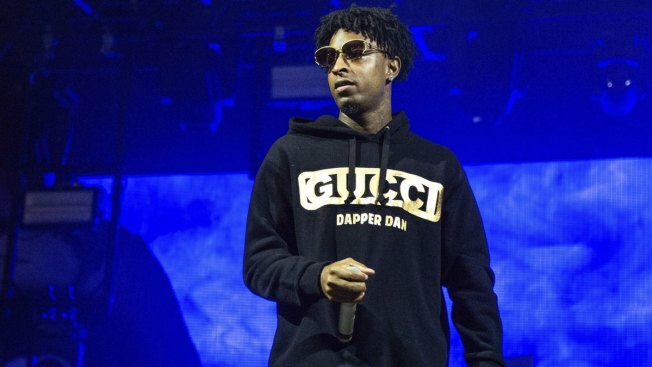 The Atlanta-based rapper 21 Savage said in an interview aired Friday that he didn't talk about his British citizenship before because he didn't want to get deported. The Grammy-nominated artist, whose given name is She'yaa Bin Abraham-Joseph, was arrested Feb. 3. U.S. Immigration and Customs Enforcement called it a targeted operation. He was released from immigration custody Wednesday on a $100,000 bond. "I knew I wasn't born here," he said. "But I didn't know like, what that meant as far as when I transitioned into an adult, how it was going to affect my life." The rapper said he wasn't hiding the fact that he isn't a U.S. citizen, but "I didn't want to get deported so I'm not going to just come out and say, 'Hey by the way, I wasn't born here.'" Abraham-Joseph said he believes the way immigration policy is enforced is broken, that he doesn't think people "should be arrested and put in a place where a murderer would be for just being in the country for too long." Attorney Alex Spiro said on "Good Morning America" that he believes Abraham-Joseph was targeted "because he's both a celebrity and they can use this as a way to send a message and also, perhaps, because of his music." "There's people that are just totally forgotten that exist in these detention centers," Spiro said, later adding, "I'm hoping people like 21 Savage will bring light to these issues and help the people that are forgotten." Abraham-Joseph's lawyers have disputed that he has a felony conviction on his record. "He has a singular offense for marijuana when he was a college-age person," Spiro said in the television interview. "That's vacated, sealed. There's no issue." Fulton County prosecutors have said they can't comment on the case, which they say was handled under the state's first offender law and is sealed. An Atlanta police report from August 2014 says Abraham-Joseph was riding in a car driven by another man when officers stopped the car after an illegal U-turn in four lanes of traffic. During a search of the car with a police dog, officers found a jar containing 22.6 grams (0.8 ounces) of marijuana, 89 hydrocodone pills, a scale in plain view, two loaded guns and $1,775 in cash the report says. Both men were arrested and charged with possession of marijuana with intent to distribute, possession of hydrocodone with intent to distribute and possession of a firearm during the commission of a felony, the report says. A notice of seizure and forfeiture filed in Fulton County Superior Court in October 2014, says the $1,775 seized during the arrest is to be forfeited. It says the violation of law alleged is that Abraham-Joseph and the other man possessed marijuana.